This review is about an incredible performance of a virtuoso. 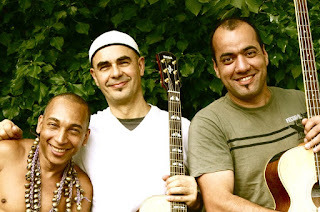 We went to listen to famous guitarist Antonio Forcione and his band on March 9th to Bilkent Concert Hall for the last concert of 16th Ankara Jazz Festival, in which Forcione played his latest album Sketches of Africa with Anselmo Netto on percussion and Matheus Nova on acoustic bass. I listened to this album’s concert last year in Edinburgh in Fringe Festival with a different band. It was certainly a great performance. I could also find the time to listen to the album several times. As mentioned by Antonio Forcione during the concert, he has decided to record such an album after staying in Africa for a while whose musical texture impressed him. I am sure that his percussive style has a profound contribution on this impression. The concert has started with a very famous solo performance of Antonio Forcione, Heartbeat. This was indeed the perfect entrance. I think the master said to us “The instrument in my hand is my beloved friend and I know every detail about it.” I suppose, this performance, during which Forcione used the guitar like a percussion instrument, impressed the audience deeply. On Antonio Forcione’s musician friends coming to the stage, we listened to the emotional and tranquil composition from the album called Tar. Following this, Stay Forever again from the album is performed successfully. The next piece is introduced by Antonio Forcione as follows: “I can’t think of making an album about Africa without him: Nelson Mandela. He jives when he is happy. This song is dedicated to him: Madiba’s Jive“. Madiba is the name of the Xhosa tribe that Mandela belongs to. I really liked the percussion performance in this performance. Anselmo Netto is a kind of percussionist that can play different things with foot and knees together. After entertaining and joyful Madiba’s Jive we have listened to the piece written for people of Zimbabwe: Song for Zimbabwe. Then there came Alhambra which is written by Antonio Forcione for Alhambra Palace. It was a marvelous acoustic performance. In an instant he pulled the upper most string of the guitar far away from the others and created more modal and mystical sounds by tightening and loosening it. Through to the end of the concert Pata Pata which is made famous by Miriam Makeba, a piece composed for a village from North Africa and Africa from the album Sketches of Africa album are played consecutively. The last piece before the encore was the energetic Maurizio’s Party. In my opinion, Maurizio’s Party was an unforgettable performance for Ankara audience. 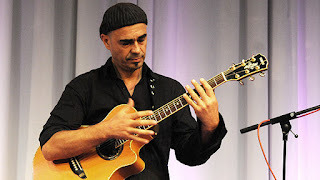 Antonio Forcione, positioned the guitar horizontally on his lap and used it as a percussion instrument sometimes by hard sometimes by soft touches. More than that, he kept rhythm by sliding it on its strings back and forth. Then there started a duello between Anselmo Netto and Antonio Forcione. Anselmo Netto has given up this duello after he has seen that some typewriter like sound is coming from the guitar of Antonio Forcione. Forcione even played main theme of Strangers in the Night by showing a couple sitting on the front seats. This performance is applauded for a very long time. For the encore, the virtuoso came to the stage alone and gave a perfect Touch Wood performance. Just before playing the piece, Antonio Forcione expressed his important ideas about Erkan Oğur and Turkish Music. We have learned that he could get the chance to play together with Erkan Oğur when he was at İstanbul for a concert and they have played together for three hours in a room. This is mentioned as one of the most important experiences in Antonio Forcione’s music life by himself. He also mentioned his admiration to the level of musicianship in Turkey which he has seen during the workshops. Forcione told us that he was pushing Turkish music for every guitar festival he knows all around the world. We were proud to hear such beautiful words from such a virtuoso about our musicians. Bilkent Concert Hall is an acoustic hall with high ceilings designed mainly for orchestral performances which do not need amplification. I have very bad experiences before during some jazz concerts held in this hall in which the volume is too high and the reverb is wild. Frankly, I was frightened to go to this hall on March 9th but what we hear destroyed my prejudgments. The volume level was perfectly set and it seems that the reverberant hall is considered and the microphone placements were successfully made according to this.